When you recently were diagnosed or even when you have been living with Pulmonary Fibrosis for a while it’s easy to just shut down. Connecting with family, friends and even other patients is harder because something was taken away and they may be holding off a bit. The opportunities to speak with somebody are sometimes more difficult because of the unbelief, misunderstandings, fears or even practical reasons like: distance. The need for comforting words, stories or new information is so important because it’s your way to express your thoughts, ideas and feelings. There are many ways to connect to the people you care about or who care about you. Whether through a phone, fax, email, letter, website, social networking websites (Facebook, Twitter, Skype, Google+) you are able to connect with people from all over the US, even all over the world. Love can be expressed, thoughts can be shared, ideas can be created and actions can be taken. Without letting people know who you are, where you are, you can feel isolated. Let people find you. There are more than 200,000 pulmonary fibrosis patients in the US only, yet on all the websites, internet support groups and local support groups only a few thousand are active. That’s wrong because with all the great efforts of the Coalition for Pulmonary Fibrosis and the Pulmonary Fibrosis Foundation to put this disease in the limelight it always comes down to numbers. Not the numbers they talk about but the number of patients that are heard throughout the US. On Search Engine Land, Greg Finn breaks down the different aspects of Facebook such as Profiles, Groups, Pages, Places, and Events. All Facebook walks you through the basic steps to create your Facebook Account. Some of the screen shots are out of date, but that’s to be expected … you will have to get used to Facebook changing its screens every couple of weeks. There are many more groups and you can access them by just typing in Pulmonary Fibrosis and selecting the group you want to be part of. Choosing your name is the most important thing. For people who are new to Skype choose a easy Skype name. If you want a additional Skype name (introducing you to other pulmonary fibrosis patients) and may be looking for other patients it’s preferable to have a (second) Skype name that everybody can find easily. (it make take some time for this formula to catch on) We suggest the following to make it easy, find patients in your state and identify you. If you search pf it may show you all the patients in the future. Search pf.virginia and hopefully only the patients in Virginia will show up. If you know anybody with their first name and state and you can look them up swiftly. Click 'Save File' to save the Skype Setup Application. Click the SkypeSetup file in the Downloads window. Follow the simple steps in the Setup Wizard to complete the installation. Can I make video calls on Facebook? What is an Online Number? 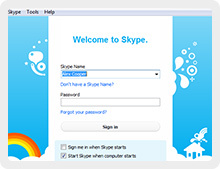 Why can't I sign in to Skype? 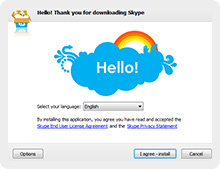 How can I pay for Skype products? "Your time is limited, so don't waste it living someone else's life. Don't be trapped by dogma -- which is living with the results of other people's thinking. Don't let the noise of others' opinions drown out your own inner voice. And most important, have the courage to follow your heart and intuition. They somehow already know what you truly want to become.Everything else is secondary."